"This recipe was created to encourage my picky kids to eat the squash that we had in abundance. 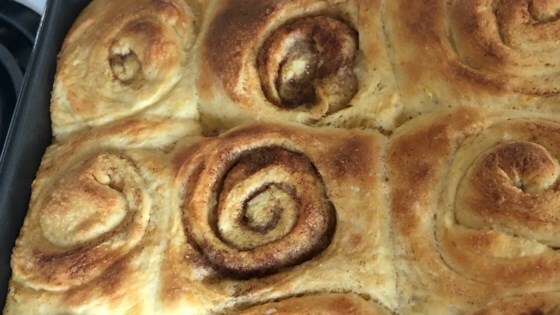 These turned out so good they like them better than the 'normal' cinnamon rolls. You can use any type of squash including butternut, acorn, hubbard, or even pumpkin. This recipe is a modified version of Winter Squash Rolls and Clone of a Cinnabon®." All-purpose flour can be used in place of the white whole wheat flour. A thinner icing can be made in place of the frosting. Beat 1 1/2 cups confectioners' sugar, 2 tablespoons milk, and 1 teaspoon vanilla extract together in a bowl until smooth; drizzle over cinnamon rolls. Water can be substituted for the milk in the icing.